So far I’ve steered clear of posting recipes on this site, I suppose because I felt it would veer away from what I saw as my blog’s main focus: perspectives on life and what it’s all about. However, more and more, I am seeing the sharing of food as integral to well-lived lives, across all kinds of cultures and groups. In my own life, community is becoming increasingly important, and food has a key role in that. More and more, I identify with Solomon’s philosophy that ‘The best thing people can do is eat, drink, and enjoy the work they must do… this comes from God.‘* Every mealtime when I say a short prayer thanking God for our food, I now find I really mean it, and the gratitude also holds within it a wordless plea for those without enough food, or without people to eat it with. It seems natural now, to share recipes, and also their stories, in a similar way to the Kinfolk book, which I have posted about before here. 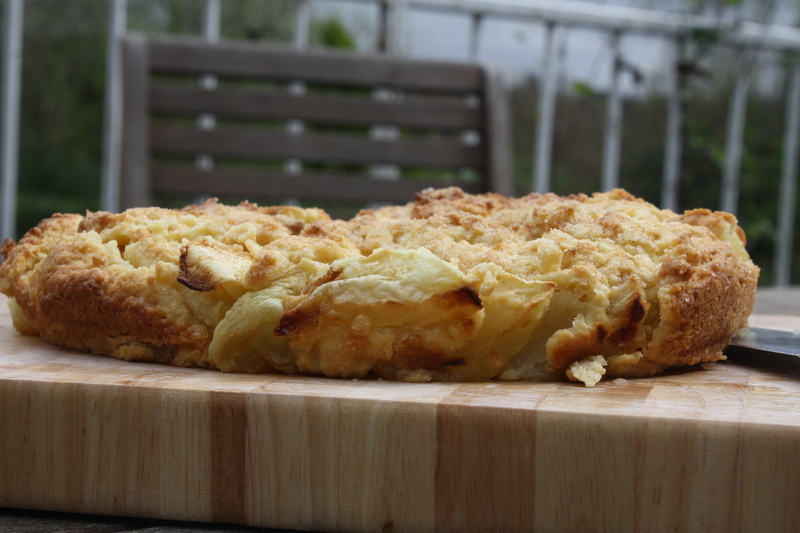 So, to start my Recipes series, I’m going to share my husband’s family’s Dorset Apple Cake. 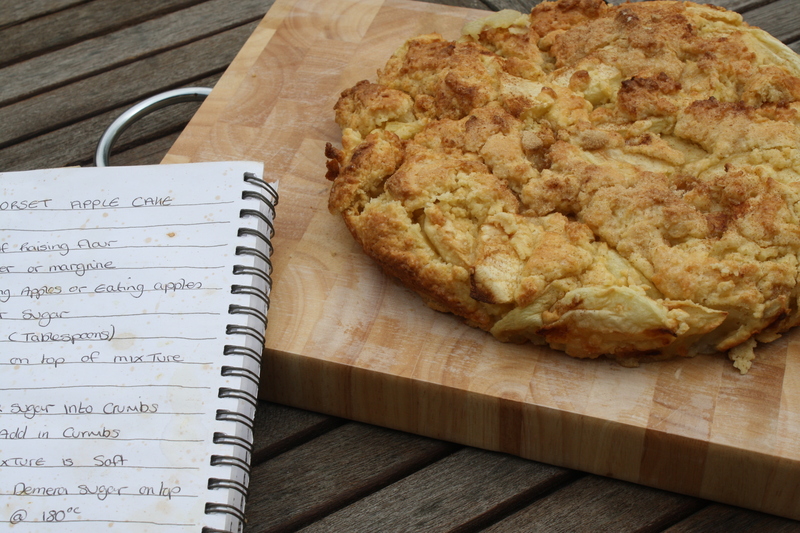 I first saw this recipe when my sister-in-law gave us a handwritten recipe book as our wedding present, and we have used it regularly since then, particularly when we were lucky enough to have an apple tree. We make this cake for ourselves, for guests and sometimes as a gift. I have moved around the UK a lot, but have always felt most at home in the countryside, so using a fruit that has grown in our gardens and orchards for centuries feels special for me and a part of my heritage. 1. Crumble the flour, butter and sugar together. It should look a bit like a crumble mix. 2. Add the apples to the mixture along with the milk – it’s up to you how gooey you want it, less milk and it will be more like a cake, more and it will be more like a pudding. Both ways it’s delicious! 3. Put in a lined tin and sprinkle some Demerera sugar on top. I usually add cinnamon too. 4. Bake for 40-50 min at 180.